Washtenaw County board of commissioners meeting (July 10, 2013): A non-voting item – the county’s bonding proposal, which is now on hold – was the focus of most public commentary at the board’s July 10 meeting, which also included a previously scheduled public hearing on the topic. Several of those who spoke are affiliated with the Washtenaw Watchdogs. The group has raised concerns about the bonding and is prepared to launch a petition drive that would force the proposal to be put on the ballot for voters to approve. The bond initiative, publicly proposed in May, was intended to cover unfunded pension and retiree healthcare obligations – for the Washtenaw County Employees’ Retirement System (WCERS) and Voluntary Employees Beneficiary Association (VEBA). The original maximum amount for the bonds had been estimated at up to $345 million. But updated actuarial data resulted in a lower estimate of about $295 million. However, on July 3, board chair Yousef Rabhi (D-District 8) and county administrator Verna McDaniel issued a joint statement announcing a decision not to put bond-related action items on the July 10 agenda. They cited the need to address unanswered questions, including uncertainty about the state approval process. No date has been set to reschedule action, if any, on the proposal. In addition to the bond proposal hearing, the board held three other public hearings during its July 10 meeting: on two brownfield plans in Ann Arbor – for 544 Detroit St. and Packard Square (the former Georgetown Mall) – and for annexing land from Scio Township into the village of Dexter to accommodate the expansion of Dexter Fastener Technologies, known as Dextech. All items were subsequently approved by commissioners. The board also gave final approval to a range of infrastructure projects totaling about $5 million for county government facilities – including redeveloping the Platt Road site in Ann Arbor where the old juvenile center was located. An amendment brought forward by Andy LaBarre (D-District 7) called for creating a 9-member advisory committee to guide the dispensation of the Platt Road site, which is located in his district. 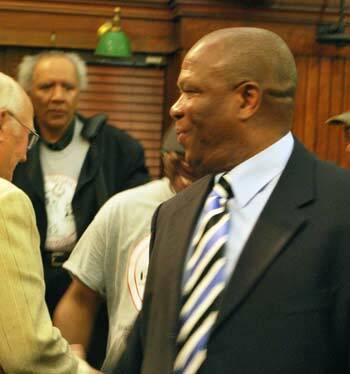 Ronnie Peterson (D-District 6) raised concerns about the authority of such a committee. He was assured that the board retains control over whether to act on the committee’s recommendations. Details of how the advisory committee will be appointed, as well as the committee’s formal mission, will require approval from the board at a later date. In other action, the board gave initial approval to a modest increase in staff for the Washtenaw County clerk/register of deeds office – bumping up a staff position from part-time to full-time – primarily to handle an increase in processing passports and concealed pistol license applications. Commissioners also made several appointments to various boards and commissions, nominated by Rabhi as board chair. He announced he wasn’t yet ready to make nominations to the county’s historic district commission. Also pushed back was a final vote on a notice of intent to eliminate a lump-sum budgeting approach for Washtenaw County’s court system. Initial approval for this action came on a 5-4 vote at the board’s June 5, 2013 meeting. But on July 10, Alicia Ping (R-District 3) – who had originally brought forward the proposal – asked for postponement until the board’s Oct. 16, 2013 meeting, citing communications she’d had with trial court chief judge Donald Shelton. The vote to postpone was 6-2, with dissent from Dan Smith (R-District 2) and Conan Smith (D-District 9). Rolland Sizemore Jr. (D-District 5) was absent. In addition to feedback about the bonding proposal, commissioners heard from leaders of two nonprofits – Washtenaw Success by 6 Great Start Collaborative and Interfaith Hospitality Network-Alpha House – about the need to support human services funding. Uncertainty about the upcoming budget has caused concern among nonprofits that have been historically funded by the county. Also during public commentary, two members of the Church of the Good Shepherd in Ann Arbor thanked commissioners and staff for quickly restoring domestic partner benefits to nine county employees, following recent court rulings that enabled the county to reinstate such benefits. Facial hair got a minor mention at the July 10 meeting, when Rabhi told Dan Smith: “Your beard is epic – congratulations on it.” Smith used the opening to mention that he’s growing the beard for his role as Lazar Wolf in the upcoming production of “Fiddler on the Roof.” The show runs from July 19-21 at the Whitmore Lake High School Theater. He received a round of applause from the board. Peterson joked that he was glad for the explanation – Peterson had been prepared to reach out to Smith with the name of his barber. Though a controversial bond proposal had been pulled from the agenda the previous week, on July 10 commissioners held the scheduled public hearing for that proposal . The original bonding proposal of potentially up to $345 million was intended to cover unfunded pension and retiree healthcare obligations – for the Washtenaw County Employees’ Retirement System (WCERS) and Voluntary Employees Beneficiary Association (VEBA). The board had set the public hearing at its meeting on June 5, 2013, and had also intended to take initial votes on July 10 on several items related to the bonding. Some commissioners have also asked whether alternatives to a bonding approach might also be viable, but the administration has not provided other options, other than a list of major cuts to programs and services. The original plan put forward by the administration was to bond for up to $345 million, although officials believed the amount would be lower than that, pending an updated actuarial report. The printed agenda for the July 10 meeting still included the bond-related items, though the items had been removed from the agenda before the meeting. The printed agenda listed the proposed bonding amount at $295.115 million. That’s the figure that Rabhi reported in a phone interview with The Chronicle on July 3. Responding to a follow-up query from The Chronicle on July 16, McDaniel said the $295 million figure was based on updated preliminary estimates for unfunded actuarial accrued liabilities (UAAL) totaling $272.999 million for both WCERS and VEBA. Interest and fees on that amount for bonding is being recalculated, she reported, but it will likely be a week or two before the new calculations are completed. After the July 10 board meeting, the county administration released an updated “experience study” from Buck Consultants, the actuarial firm used by the county. An experience study is the basis for the final actuarial report, which has not yet been completed. [.pdf of 2013 experience study report] A preliminary report on this study was presented at a special joint session of the WCERS and VEBA boards on June 25. The 7-member WCERS board includes county commissioners Dan Smith and Conan Smith, county administrator Verna McDaniel and county finance director Kelly Belknap. Conan Smith also sits on the 5-member VEBA board, which is chaired by county accounting manager Pete Collinson. Buck Consultants had recommended adopting a 10-year amortization schedule for the county’s unfunded actuarial accrued liabilities (UAAL), in order to cover those liabilities as quickly as possible. The county administration had originally expected to pay an estimated $30 million contribution toward the WCERS and VEBA obligations in 2014, if bonding did not occur. That amount was based on the 10-year amortization schedule. At the June 25 special meeting, however, the WCERS and VEBA boards voted to adopt a longer, graduated amortization schedule for the UAAL of 27 years (WCERS) and 26 years (VEBA), with the amortization schedule decreasing annually by a two-year period. This change will lower the UAAL contributions county will need to make to cover its obligations each year. In an email to The Chronicle on July 16, McDaniel indicated that revised estimates for the 2014-17 budget will be reported at the county board’s July 24 ways & means committee meeting. She estimated the amount for 2014 is now expected to be about $26 million, instead of $30 million. The final actuarial report by Buck Consultants is expected to be delivered to the WCERS and VEBA boards later this week. Those boards have set a joint meeting for Tuesday, July 30 to review the material. The meeting starts at 10:30 a.m. in the boardroom of the county administration building, 220 N. Main St. in Ann Arbor. 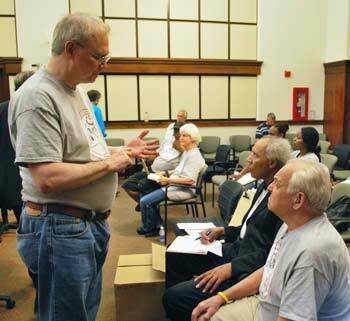 The first public hearing on the bond proposal had been held on June 5. That public hearing drew four people who all expressed caution about the possible action, as some attendees suggested a millage or additional budget cuts to cover the retiree obligations – instead of bonding. On July 10, more than a half dozen people spoke at the public hearing as well as during two opportunities for public commentary. Many of the speakers were affiliated with a group called the Washtenaw Watchdogs, which has raised concerns about the bonding and is prepared to launch a petition drive that would force the proposal to be put on the ballot for voters to approve. 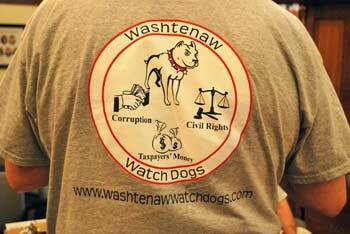 In addition to the speakers, several other members of the Washtenaw Watchdogs – many of them wearing the group’s T-shirt – attended the meeting. The back of a T-shirt for the Washtenaw Watchdogs. Doug Smith, one of the group’s organizers, spoke at both opportunities for public commentary, as well as at the bond proposal’s public hearing. He told commissioners that he’d watched presentations at the board’s last working session on June 6, and noted that the projections all assume that the bonds could be sold at a 4% interest rate, while the market returns would be about 6 or 6.5%. The proposal ignores the millions of dollars it would cost to initiate an intermediate trust and to sell the bonds, he said, as well as the cost of managing the trust. The bonds would be taxable, and could be recalled early, Smith said – which is good for the county, but makes the bonds less attractive to investors. Current rates for taxable municipal bonds are rising, and will likely to continue to increase, he noted. Smith suggested looking at the county’s current pension trusts to gauge possible investment returns, and the cost of managing those investments. The WCERS trust has earned an average 8.2% since it was formed in 1981, he noted, but most of the higher returns were in the 1980s and 1990s, when inflation and interest rates were much higher than now. The country was also going through a tech revolution at the time, he said, and it’s unlikely the markets will see another period like that. Since 2000, the net gains for the WCERS trust have been 2%. The VEBA trust has an average 3.5% net gain since it was formed in 1997, and since 2000 the net gain is 2.4%. The trusts are paying more than $1 million in expenses to financial managers that are underperforming, he said. Smith also pointed to the actuarial risk – what if retirees live longer than expected? If the county ends up needing to pay more to retirees while it also repays the bonds, that’s a money crunch. “But all of you will be long-gone from the board by then,” he said. It’s also possible that the bonds will be sold at up to 5.5% interest, and that the return on investments from those funds will be lower, he noted – that’s not an unrealistic scenario. He then described two scenarios for possible outcomes of the bond’s investment trust. If the county borrows $300 million and invests it in the stock market, in one scenario the investment return might be 10% ($30 million) in the first year. But if the required contribution that year to the retirement trust is $29 million, and the investment expenses are $1 million, you end the year with the same $300 million. Smith described a second scenario in which the county loses 10% ($30 million) in the first year, but still has to make the $29 million contribution to the retirement trust and the $1 million in expenses. So the county ends the year with only $240 million. All future years would reflect that initial loss, he said. In 2008, the WCERS fund lost 33% on its equity investments, Smith noted. Though there might not be a worse year in the future, he said, it’s likely there will be another financial meltdown of some sort in the next 25 years. Bond counsel John Axe and the Eastern Michigan University professor who made a presentation at a board working session earlier this year made rosy projections, he said. But those projections don’t consider that funds must be paid out every year to the WCERS and VEBA trusts, Smith said. The payouts make the timing of losses important, and the county might never recover from early losses. Smith also pointed out that most experts feel the market is currently overvalued. And because there’s an inverse relationship between the bond market and stock market, the county might be putting taxpayer money into the stock market at just the wrong time, he said. What will happen if the intermediate trust runs out of money before the bonds are paid off? The county would have to pay off the bonds as well as contribute to the retirement trusts. “That’s going to be a much worse cash flow problem than you’re now facing.” He asked commissioners not to approve the bonding proposal, or at the very least to let the voters decide. If the board votes to move ahead with the bonding, Smith said, he and others are prepared to gather the required signatures to put the proposal on the ballot as a voter referendum. They need only 15,000 signatures, he noted, and they already have about 25 volunteers to circulate petitions. The Washtenaw Watchdogs will have a booth at the Ann Arbor art fairs on Liberty Street near Division, and they’ll be going to other events and canvassing neighborhoods as well. He also encouraged potential volunteers to visit the group’s website. Ray Williams asked how many commissioners would mortgage their house to play the stock market. That’s what the county is planning with this bond proposal, he said. “If you are not prepared to do the same with your own money, why is it a good idea for the taxpayers of Washtenaw County to do the same thing?” He didn’t want Washtenaw County to be like other counties that had made risky investments and that were now bankrupt. It’s hard to believe the county can’t find ways to eliminate its deficit without bonding, he said. The decision will affect citizens for the next 25 years, Williams said, and it should be put on the ballot so that taxpayers can decide. If the board votes to bond, Williams said he’d do everything he could to help collect the 15,000 signatures needed to force a ballot referendum. Thomas Partridge also spoke at both opportunities for public commentary, as well as during the public hearing. He expressed concern over the proposed bonding, and urged the board not to do it. The county’s ability to bond should instead be used to build affordable housing and to provide other services for this area’s most vulnerable residents. He criticized the fact that most of the county’s revenues come from property taxes, which he characterized as a 19th century concept that gives property owners more influence in the political process. He accused Democratic commissioners of supporting a totalitarian state administration that aims to limit the role of government, even though there are homeless people outside the door of the county administration building, he said. During her second turn at public commentary, Bloss told commissioners that she’s experiencing some unfunded liabilities in her own life, related to medical expenses. However, she’s not planning to borrow money from her home equity line of credit to pay those bills and to invest in the stock market, hoping to realize a profit. It’s not the job of county government to borrow money and invest it to make a profit, she said. Bloss noted that about 70% of the county budget funds mandated expenses, but the rest is discretionary. She suggested as a starting point to cut taxpayer funding for Planned Parenthood, which she accused of killing babies. She didn’t want blood on her hands. A man from Webster Township told commissioners that they were elected to spend the money that the county collects from him and other taxpayers. But now, the board is looking to borrow money on behalf of the taxpayers. In the past, the county has borrowed for things like the jail and civic improvements, he said. It’s a noble reason to pay for retiree pension and health care, but the county would be borrowing against the fiscal well-being of its residents. It’s disrespectful if commissioners don’t put it on the ballot for voters to decide, he said. The July 4th celebration was initially based on the issue of rebelling against taxation without representation, he noted. And even though the bond proposal isn’t direct taxation, he concluded, it’s still a burden on the community. Les Heddle referred to the information about the bonding proposal that’s posted on the county’s website. Many pertinent questions are still unanswered, he said, including the fact that the county is using data that’s 18 months old. It’s hard to believe that there isn’t a way to get more current data, he said. He believed current data would show a much lower level of unfunded liabilities. He also didn’t understand how the board had been ready to vote on this proposal when the staff hadn’t provided all of the necessary information regarding the state requirements. Who’s doing the due diligence? he wondered. It’s an egregious error and lack of judgment by the staff. He said he was trying not to get angry, because he had a lot of friends on the board. He indicated that if this had happened in the private sector, it would not be acceptable. “There should be some accounting for that, all the way up and down the line,” he said. Heddle said that in his business, if he doesn’t live up to his clients’ expectations, they can take their money elsewhere. [Heddle is a financial advisor with Edward Jones in Ypsilanti.] He again questioned why the county administration wasn’t able to provide a proposal based on more up-to-date information. The board needs to get an answer from the administration about why they’re using data that’s so old. It might give some insight into why the county is in its current situation, Heddle said. He also criticized the county’s bond proposal website for not being updated regularly. From left: County financial analyst Tina Gavalier and finance director Kelly Belknap. During the public hearing, Heddle addressed several issues related to the list of answers to Frequently Asked Questions on the county’s bonding website. For example, one of the FAQs asked what will happen to the proceeds if the intermediate trust outperforms the bond payments, he noted, but it doesn’t ask what happens if the trust underperforms. Heddle said it’s difficult to find useful, up-to-date information, or anything that indicates what will happen if the bonding doesn’t work as planned. Stephen Ranzini suggested an alternative to the current bonding proposal, which he called misguided. He indicated that although interest rates are low, the stock market is overvalued and that will result in future substandard performance. The short-term benefit from the “financial engineering” that the bond deal promises will turn into future losses. He told commissioners that in 1988 when he was 23 years old, Bank One lent him $3.2 million to buy a tiny bank that’s today is known as University Bank. The loan for this leveraged buyout was made because “I’d figured out something the sellers didn’t know – that the bank’s pension fund was overfunded.” After buying the bank, he terminated and defeased the bank’s pension plan by buying an annuity from a triple-A-rated life insurance firm. The extra funds from that deal – about $800,000 – were used to fund an employee stock ownership plan, he said, which purchased common stock in the bank holding company and paid down the loan to Bank One. In a similar way, Ranzini said, the county could defease its retirement plan by buying an annuity from a top-rated insurance firm. It would require taking on debt, he noted, but this approach would lock in today’s low interest rates and eliminate future investment risk. Because insurance companies are “hungry” for these types of long-term annuities, he added, it would likely cost less than the bond proposal. The downside is that the county would lose control over its pension fund dollars, but it’s no great loss if the county doesn’t intend to use those funds for local economic development, Ranzini argued: “In fact, it prevents possible future mischief.” He recommended this same approach to all local units of government. Wes Prater, a former county commissioner from York Township, noted that the county’s No. 1 guiding principle – as posted on the county administrator’s website – is to ensure long-term fiscal stability. He believes in that principle, and there’s a lot of work to be done. Since 2007, the county’s long-term liabilities have increased over $15 million each year, he said. Some of those liabilities don’t show up on the balance sheet, he noted. At the end of 2012, the county had net assets of $230 million, Prater said, compared to $446 million in long-term liabilities, including between $250 million to $300 million for pension and retiree health care. The board needs to look at what has happened in the past, Prater said, and at how the county has arrived at its current situation. He said he was willing to step forward and work on a committee to research how to address these issues. Prater also wondered when the updated actuarial report and the independent financial analysis of the bond proposal would be completed. How do citizens get the information they need to make informed decisions? he asked. Prater also wanted to know how the intermediate trust fund would work. There are several issues that need to be cleared up, he concluded. Ronnie Peterson said he appreciated the delay in voting on the bond proposal. He noted that advocates for human services programs are interested in the impact on their funding if the county doesn’t bond. 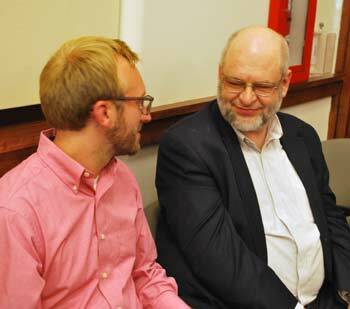 [Two leaders of nonprofits that the county funds – Washtenaw Success by 6 Great Start Collaborative and Interfaith Hospitality Network-Alpha House – spoke during public commentary, urging continued support of human services.] He assured these groups that he will advocate for them. Peterson asked for the board chair or administrator to explain what will happen next regarding the bond proposal. He vowed that the county would honor its obligations to retirees, regardless of whether the board decides to bond. Board chair Yousef Rabhi responded, first by describing the public outreach that had been done related to the bond proposal, including public hearings, coffee hours, a press conference and public forum. None of that had been required, he said, but the board believes in engaging citizens in these decisions. The delay is due in part because of a recognition that more questions need to be answered, he said. Several commissioners had raised concerns that need to be addressed, he added, and the state still is figuring out the process for this kind of bonding. The fact that residents showed up that night to address the board is a testament to the fact that this has been an open process, Rabhi said. The public has been engaged and has asked questions. Moving forward, he said, the county must have a balanced budget for 2014 by the end of this year, independent of any decision to bond. The board has held discussions at its meetings and retreats about the budget, he noted, but now it’s time to really focus on priorities and engage the community on that. The board will be moving into an intensive process now, delving into the budget and providing guidance to the administration, he said. Rabhi said he feels optimistic about the process, and that the county is emerging from the recession and looking at better times ahead. Later in the meeting, Dan Smith asked for clarification about the process by which the board will explore other alternatives to the bonding proposal. He said he wasn’t asking about specific alternatives at this point, but wanted to know how various alternatives would be discussed and vetted by the board. 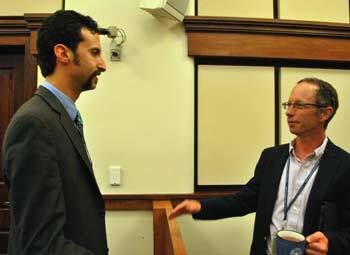 From left: County commissioner Yousef Rabhi (D-District 8) and Andy Brush, the county’s IT manager. Rabhi replied that any alternatives would be brought forward as part of the budgeting process. Felicia Brabec will be leading the budget process for the board, he said, including a discussion at the board’s July 11 working session. Dan Smith noted that until now, the board has generally discussed the budget and the bonding proposal separately, although he observed that obviously the topics are intertwined. Now, he said, it seems those discussions will be brought more closely together than previously. Peterson asked whether the discussion would revolve around a four-year budget. When Brabec noted that the board had authorized the administration to move forward in developing a four-year budget plan, Peterson pointed out that he had voted against that action. [The board had taken that vote at its May 1, 2013 meeting, over dissent from Peterson and Rolland Sizemore Jr.] Peterson said he would vote against a four-year budget if it’s presented. Multi-year budgets sometimes result in problems getting pushed back, he said, or in borrowing a lot of money to deal with the county’s obligations. Andy LaBarre, who chairs the board’s working sessions, noted that the following night there would be a discussion of budget priorities, and he implored everyone to attend. Peterson reported that he had a previous commitment and would not be present. LaBarre also responded to a remark made by Doug Smith during public commentary. LaBarre noted that the EMU economics professor mentioned by Smith was Jens Stephan, who LaBarre said gave up about 4.5 hours of time to talk with commissioners at the June 6 working session. Stephan wasn’t advocating for any particular approach, LaBarre stressed, and was simply showing commissioners a tool they could use in making their decisions. “I want to make sure that’s on record, that he did us a public service,” LaBarre said. Rabhi also provided a phone number that residents can call to give input on the bonding proposal via voicemail: (734) 222-6666. He also requested that the staff update the website with answers to the questions that had been raised during public commentary and the public hearing. Peterson wanted to know that if the county changes its plan for the bonding proposal, would the board hold another public hearing? Rabhi replied that none of the public hearings were required by law. But if commissioners feel the need for more public participation, they can certainly schedule more public hearings, he said. Peterson felt it would be respectful to citizens to hold another public hearing, if the proposal changes in any way. It’s unclear what actions might be taken next regarding the bonding proposal. The administration has previously stated that the bonding proposal was crucial to developing a four-year budget from 2014-2017. The administration has set a goal of identifying $6.99 million in structural reductions for the overall 2014 general fund budget, based on the assumption that the bonding would take place. Without the bonding, the county had expected to pay an estimated $30 million contribution toward these obligations in 2014, with additional amounts varying in subsequent years. That amount will likely be lower – estimated by McDaniel at around $26 million – based on updated actuarial information and recent decisions by the WCERS and VEBA boards. Commissioners had previously voted to hold an extra meeting this month, on July 24. That meeting will be held as planned, but instead of bonding, the main topic will be a discussion of budget priorities. Two brownfield plans – for projects located in Ann Arbor – were on the agenda for both initial and final votes of approval, following public hearings on each plan. The projects are at Packard Square (the former Georgetown Mall) and 544 Detroit St. The Ann Arbor city council had signed off on the plans at its June 17, 2013 meeting. Both plans had been recommended for approval by the county’s brownfield development authority at its June 6, 2013 meeting. Brownfield Plans: 544 Detroit St. The 544 Detroit St. project is seeking brownfield status so that it will be eligible for brownfield tax increment financing. The site plan calls for a three-story “flatiron-style” building, located at the triangle tip of Detroit and North Division, just southwest of the Broadway bridge – the site of a long-abandoned gas station in the Old Fourth Ward Historic District. The new building would include offices on the first floor and residences on the upper two floors. At the county board’s July 10 public hearing on this project, two people spoke. Thomas Partridge criticized the board for not providing sufficient information about items on the agenda. He called on the owners of these sites to explain how the sites became contaminated, and asked that the current developers explain why the site can’t be developed without governmental assistance. That assistance could better be spent on other programs for the public benefit, like Head Start and affordable housing, he said. Bret Stuntz spoke briefly on behalf of the developer – 544 Detroit Street LLC – saying he was there to answer any questions. Stuntz is a project manager at AKT Peerless Environmental & Energy Services. For Packard Square – the former Georgetown Mall site at 2502-2568 Packard St. – approval related to an amendment to the project’s original brownfield redevelopment plan, which the county board approved after much debate on May 18, 2011. At that same meeting, the board also approved a $1 million grant application to the state Dept. of Environmental Quality for brownfield cleanup at the proposed $50 million development. That grant was later awarded to the project. The project entails building more than 200 apartments and 20,000 square feet of commercial space. Equipment at the Packard Square site. 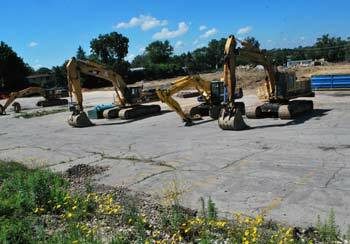 Buildings at the former Georgetown Mall have been demolished. The amendment to Packard Square’s brownfield plan would add two eligible activities that qualify for brownfield tax increment financing: underground parking and urban stormwater management infrastructure. Those activities are now eligible for TIF, following changes by the state legislature to the Brownfield Redevelopment Act 381 in December 2012. According to a staff memo, TIF-eligible activities total $3,582,222. Over the 14-year period of the plan, up to $5,840,557 of local and state taxes will be captured for eligible activities, administrative costs, and the Washtenaw County brownfield redevelopment authority local site remediation revolving fund. This amount is unchanged from when the plan was initially adopted. The developer of this project is The Harbor Companies of Bloomfield Hills, via Harbor Georgetown LLC. Two people spoke at the county board’s July 10 public hearing for Packard Square. Thomas Partridge said he was concerned about the practice of local governments applying for federal or state funds simply because those funds are available. In this case, public funds are being used to remove toxic substances and contaminated soil from these sites, so the need for those funds should be substantiated at a public meeting, he said. Partridge was concerned about the possibility of contaminated soil being spread around the neighborhood. Developers should be able to finance these projects without public assistance, he concluded. John Byl introduced himself – he works for the law firm Warner Norcross & Judd, which is working on the Packard Square project. He thanked Nathan Voght and other county staff for their work, and thanked the board for considering the brownfield plan amendment. The maximum amount is unchanged, he noted, but a couple of categories are being added to the list of things that can qualify for TIF. Byl thanked the Ann Arbor city council and county brownfield authority board for approving the plan. He noted that Bruce Measom, representing the developer, was on hand to also answer any questions that commissioners might have. During a break at the July 10 meeting, Byl and Measom told The Chronicle that the project was moving ahead. The public hearings reported above were held at the board meeting, which takes place after the meeting of the ways & means committee, on which all board members serve. But the brownfield items were first considered at the ways & means committee for an initial vote, prior to the public hearings. As the board reached the brownfield agenda items at its ways & means committee meeting, Thomas Partridge spoke up from the audience, saying he wanted to comment. Felicia Brabec, who chairs the ways & means meetings, told him that it wasn’t an appropriate time to address the board, but that there would be a public hearing on these items at the regular board meeting that night. Their exchange prompted commissioner Ronnie Peterson to raise some procedural concerns about the approval process. He felt the public hearing should be held prior to the initial vote at the board’s ways & means committee meeting. So he thought that Partridge’s interruption had been appropriate. Andy LaBarre clarified with the county’s corporation counsel, Curtis Hedger, that there would be an additional public commentary time at the start of the board meeting, as well as the public hearing – two additional opportunities for input. Hedger said that under law, since the public hearing comes before the final vote, there is adequate opportunity for public input. In a perfect world, he added, it would be better to hold the public hearing on a different day, and then take an initial vote at ways & means on one date, and a final vote at the regular board meeting two weeks later. But an accelerated approach has been taken in the past, he noted, especially during the summer months when agenda items often receive an initial and final vote on the same night. There’s been abundant opportunity for public participation, Smith said. He also pointed out that action on the Packard Square plan is an amendment to change the scope of the project, but it doesn’t change the brownfield investment. He characterized it as a “ministerial” change. There has already been a robust public process for that Packard Square plan, Smith said. Yousef Rabhi noted that he serves on the county’s brownfield development authority board. He praised the 544 Detroit St. project, saying it would be a great addition to the neighborhood and will clean up a contaminated site. The Packard Square project is in his district, Rabhi said, and he asked Nathan Voght – an economic development specialist with the county – to give an update. Voght described how the board had authorized applying for a $1 million state grant two years ago, which had been received last year. The part of the project covered by the grant started in late May of 2013, and included demolishing the buildings and cleaning up contaminated soil. That’s been done, he said, and there will be a slight period of “demobilization” as the developer puts in place all of the financing and development plans. Peterson clarified that he had no problems with the plans or the staff, calling the projects “outstanding.” He felt the board needed to follow proper procedures, and suggested that the summer schedule should be reconsidered. Regarding 544 Detroit St., Dan Smith said he has nothing against the project. But he noted that the board continues to approve various TIF programs – for brownfields, downtown development authorities (DDAs) or local development finance authorities (LDFAs) – without a plan for the outcomes of those investments. “We pretty much rubber stamp these programs. We don’t really have any criteria to evaluate them against,” Dan Smith said, adding that anyone who votes against any particular project would be perceived as being against that specific project or community. He said he wanted to raise that concern again. Outcome: To protest the process, Ronnie Peterson cast the sole vote against both brownfield plans on the initial vote at the ways & means committee meeting, but joined all other commissioners in supporting the plans in the final vote at the board meeting. Commissioners were asked to give final approval to a range of infrastructure projects totaling about $5 million for county government facilities – including redeveloping the Platt Road site where the old juvenile center was located. Commissioners had given initial approval to the overall proposal – called the “strategic space plan” – at their June 5, 2013 meeting. At 200 N. Main in Ann Arbor, consolidate the land records from the building’s lower level to the 1st floor, and remodel the lower level to accommodate administrative offices. At 220 N. Main in Ann Arbor, repurpose space in the garden level, including redesigning conference room space. At 110 N. Fourth in Ann Arbor (known as the Annex), relocate the Office of Community and Economic Development, Office of Infrastructure Management, and the Public Defender’s office to other leased and county-owned space. 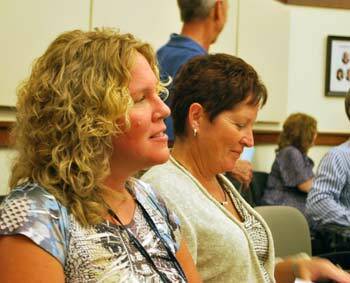 At the county’s service center near Washtenaw and Hogback, redesign the Learning Resource Center (LRC) as a full conference center, providing county-owned space for large and small meetings. Also, make parking improvements, including adding 110 new spaces, rebuilding the lot between the LRC and the courthouse, and resurfacing the entry drive off of Hogback. At a location to be determined, develop a specialty vehicle storage facility for the sheriff’s office and other departments. According to Greg Dill, the county’s infrastructure management director, no general fund dollars will be used for the projects, which are estimated to cost about $5 million. Funding will come from several sources: (1) $1 million from the 1/8th mill fund balance; (2) $650,000 from the facilities operations & maintenance fund balance; (3) $650,000 from the Office of Community & Economic Development reserves; (4) $500,000 from the tech plan fund balance; and (5) $2.2 million from the county’s capital reserves. 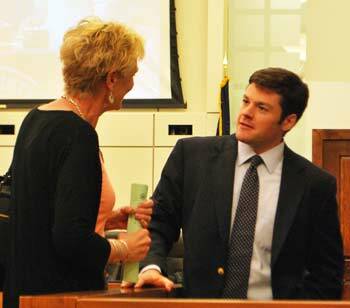 Dill had briefed commissioners on the plan at a March 20, 2013 working session. In addition to the projects listed above, other changes will be made to accommodate the county’s Community Support and Treatment Services (CSTS) unit, which provides contract services to the Washtenaw Community Health Organization (WCHO). The WCHO will pay for that facilities work, including moving the entire Adult MI program staff to the Annex at 110 N. Fourth; repurposing vacated space at 2140 Ellsworth for Youth and Family Services; and relocating all “service delivery” units to the 1st floor of the Towner II building at 555 Towner Street in Ypsilanti. Andy LaBarre proposed a two-part amendment. One part directed staff to use the county’s existing vendor pool for work on these projects, whenever feasible. The amendment also called for the creation of a 9-member community advisory committee to guide the dispensation of the Platt Road site, which is located in LaBarre’s district. The space plan proposes demolishing the former juvenile center and exploring redevelopment of the site at 2260 and 2270 Platt Road for affordable housing, alternative energy solutions, and county offices. Details of how the advisory committee will be appointed, as well as the committee’s formal mission, will need to be worked out and will require approval from the board at a later date. LaBarre said that his amendment was intended to address some of the issues that had been raised when commissioners discussed this item on June 5. Regarding the advisory committee, Ronnie Peterson said the proposal was a “total surprise” to him, and it seemed to be giving control over a $1 million property to an entity other than the county board. There are procedures for dealing with the dispensation of county property, he said, and he wondered what authority the committee would have. Corporation counsel Curtis Hedger clarified that the committee is advisory only. It has to report back to the board, he added, and the board can either accept the committee’s recommendations or not. “Ultimately, it’s still up to the board as to what they want to do, collectively, with the Platt Road site,” Hedger said. The intent of the committee is to have citizen input. Peterson indicated that the board has dealt with other controversial proposals, like the jail expansion, without this kind of committee. He said he wasn’t against the advisory committee or citizen input, but he was concerned about setting a precedent. Peterson wondered if they could postpone action until there were more details about how the process would work. Hedger replied that a more detailed resolution would be required at a future meeting to appoint the members and approve the committee’s charge. Be it further resolved that the board of commissioners create a nine-member Platt Road community advisory committee to review and develop a recommendation for the disposition of the county’s Platt Road site. The composition and charge of the advisory committee will be determined by the board of commissioners at a later date, provided however that the board of commissioners shall have the authority to ultimately determine the disposition of the Platt Road site. Board chair Yousef Rabhi clarified that he would be nominating people to the committee, who would then be confirmed by the full board. Alicia Ping felt the process should follow the board’s normal process for other boards and commissions, with people submitting applications for the positions. Rabhi indicated that as an ad hoc committee – not a standing committee – the process would be different, but that applications can be solicited if commissioners wanted to handle it that way. Ping encouraged that approach. Regarding the vendor pool portion of the amendment, Ping asked for more background about why this direction was necessary. Dill replied that any of the county’s capital projects use the vendor pool to help augment outside professional services that are hired. The pool allows the county to be more efficient and cost effective, he said, in terms of keeping up with a project’s timeline. Every company that’s part of the vendor pool has already gone through the county’s procurement process, he noted, and has been vetted by the purchasing department. Ping wondered if the county had a sufficient number of companies in the vendor pool to match all of the needs for upcoming capital projects. No, Dill replied. But using the vendor pool would allow projects to use some companies that have already gone through the RFP (request for proposals) process, rather than issuing RFPs for every aspect of a project. Ping clarified that for larger projects, the work goes out for a competitive bid. Dill said that when a project goes over a certain dollar amount, the county moves away from using the vendor pool and uses a competitive bidding process. The strategic space plan encompasses several smaller projects, he added. Conan Smith noted that the amendment is worded in such a way that could lead to a very large piece of work being handled by a firm in the vendor pool, rather than going out for a competitive bid. He proposed amending LaBarre’s amendment to designate using the vendor pool for projects under $100,000. His suggestion was accepted as a friendly amendment. Outcome: Commissioners unanimously gave final approval to the strategic space plan, as amended. A proposal to postpone the final vote on a notice of intent to eliminate a lump-sum budgeting approach for Washtenaw County’s court system was on the July 10 agenda. The board had voted last month 5-4 to give initial approval to the notice – at its June 5, 2013 meeting. The proposal had been brought forward by commissioner Alicia Ping. The move caught some commissioners by surprise, though for several weeks during budget deliberations Ping had expressed concerns over the county’s approach to funding the court system. Voting in favor of initial approval on June 5 were Ping, Conan Smith, Dan Smith, Andy LaBarre and Kent Martinez-Kratz. Voting against the proposal were Yousef Rabhi, Ronnie Peterson, Rolland Sizemore Jr. and Felicia Brabec. Ping had noted that her goal wasn’t necessarily to cut funding for the courts, but rather to be more transparent about where the money goes. Giving notice to terminate the agreement would have provided the board the option to end the agreement. No court officials had attended the June 5 meeting, because the proposal had not been on the published agenda. However, Donald Shelton, chief judge of the trial court, subsequently spoke with several commissioners, including Ping, about their intent. The courts have historically been in favor of a lump-sum approach – rather than the line-item budget provided by most other units of county government. The courts operate under a memorandum of understanding with the board of commissioners. The board unanimously approved that MOU on Jan. 19, 2011, replacing one that had been in place since 1990. [.pdf of memorandum of understanding] The agreement states that the county will provide “lump sum” funding to the courts, allocated to: (1) the trial court – an entity that includes the 22nd Circuit Court, court clerk services, juvenile court, Friend of the Court, and probate court; (2) 14A District Court; and (3) a portion of the county’s child care fund. The county does not have line-item budgeting authority, but the courts agreed to submit a bi-annual line-item budget, and to provide quarterly financial projections. She said she wanted to give commissioners time to digest the additional information, and to hear the county administrator’s budget proposal for the general fund, which is expected in October. If the board decides to move forward with terminating the memorandum of understanding, it would still give the courts enough time to prepare for the next budget year (2015). Outcome: On a 6-2 vote, commissioners postponed the item until the board’s Oct. 16, 2013 meeting. Dissenting were Dan Smith (R-District 2) and Conan Smith (D-District 9). Rolland Sizemore Jr. (D-District 5) was absent. Commissioners were asked to give final approval to the annexation of land from Scio Township into the village of Dexter. They had taken an initial vote at their June 5, 2013 meeting. According to the county’s corporation counsel, Curtis Hedger, the annexation of township property into a village is one of the few instances that requires county board approval. Generally, annexation is handled by the individual municipalities where the annexation occurs. A letter to the county from Dexter village manager Donna Dettling stated that the annexation request – for a 16.66-acre property – was made by the property owner, Dexter Fastener Technologies, known as Dextech. The land is adjacent to the Dexter Business & Research Park, where Dextech hopes to expand. The company is Dexter’s largest employer. Four people spoke at a public hearing on the annexation. Thomas Partridge said the proposal reflected 19th century politics, and he urged all the townships, villages and cities in Washtenaw County to combine resources into one metropolitan authority under one government, with shared tax revenue and shared purpose. He indicated that such an approach would provide resources for health care, transportation, education, food and other needs. Dexter village president Shawn Keough thanked commissioners for putting it on their agenda in a timely fashion. He called Dexter Fastener Technologies a wonderful business in the community. As the largest business in the Dexter area, the firm provides a lot of taxpayer dollars to the village, Scio Township and the county, he said. He asked for the board’s support. A representative of Dextech told commissioners that the firm needs to expand to meet the needs of its customers, which are primarily in the automotive industry. He said the firm doesn’t take this move lightly, and company officials appreciate the cooperation of Scio Township and Dexter to come up with a plan that’s beneficial to all concerned. Dan Smith wondered how the boundary change would affect Dexter’s attempt to become a city. Dexter president Shawn Keough responded, saying that it has a very small impact procedurally at this time. After the village receives cityhood status for its current boundaries, an additional boundary modification would be required to bring in that parcel. Outcome: Commissioners voted unanimously to approve the annexation. On the agenda for initial approval was a modest increase in staff for the Washtenaw County clerk/register of deeds office, primarily to handle an increase in processing passports and concealed pistol license applications. The change involves creating a full-time administrative coordinator position from a job that’s currently part-time (an 0.64 full-time equivalent position). The total cost for that full-time position is estimated at $56,902 – or an additional $15,631 in general fund support. It’s expected that a decrease in the need for temporary workers will help offset the payroll increase, as will a projected surplus in license and permit revenue. According to a staff memo, that revenue is expected to exceed projections by at least $33,824. From left: Ed Golembiewski, the county’s director of elections, and county clerk/register of deeds Larry Kestenbaum. Until mid-2008, the office had 5 full-time employees (FTEs) in the elections and administration division, which handles passport applications and concealed pistol licenses (CPL). The economic downturn and subsequent restructuring dropped staffing levels to 3.64 FTE positions. If the total number of applications in 2013 reaches projections of at least 3,225, then that will generate revenue of $83,824 to the general fund – above the original 2013 budget amount of $50,000. In addition, on July 10 commissioners were asked to give initial approval to shift support for one full-time position in the clerk/register of deeds office back into the general fund, at a cost of $56,117. That position – a records management specialist – is currently funded by revenues from the office’s “automation fund.” Until 2008, that position was paid for out of the general fund. The automation fund gets revenue from a $5 surcharge on every deed that’s processed, and is a statewide authorized fee that pays for technology related to the work of the clerk/register of deeds office. It pays for digitizing the county’s land records from 1824 through 1958, which are currently available only on paper. The goal is to relocate the paper records and clear out space in the lower level of 200 N. Main Street, as part of the county’s “space plan.” Digitization will also allow the public to quickly search and retrieve county records electronically, which will generate usage revenues for the general fund. Revenues for online usage increased from about $220,000 in 2010 to about $323,000 in 2012. According to a staff memo, the number of documents recorded by the county clerk/register of deeds office has increased from fewer than 53,000 documents in 2008 to more than 85,000 documents expected in 2013. Revenues from the office to the general fund have grown from $2.248 million in 2011 to $3.198 million in 2012. Those revenues are expected to continue growing as the local real estate market recovers. Dan Smith pointed out that this is the third time in 2013 that the board has been asked to approve an increase in staffing. In isolation, each increase makes sense, he said. But as the headcount changes over time, it’s troubling. Felicia Brabec asked Kestenbaum to elaborate and explain why it doesn’t change the headcount. Kestenbaum said the change entails moving a position from part-time to full-time. That’s based on the need to cover the tremendous increase in applications for concealed weapon licenses. The other change is to shift the funding source for an existing position into the general fund. As the land economy has improved, the number of associated transactions handled by his office has increased, Kestenbaum said. It’s important to keep up with those transactions to avoid delay, he added. Kestenbaum also noted that his office is giving up its space in the lower level of the administration building at 200 N. Main, as part of the strategic space plan for county facilities. The documents stored there are being digitized, and he wasn’t expecting the move to happen on such an accelerated schedule. Money for this digitization process comes from the automation fund, he noted. By shifting the funding for one employee out of the automation fund and into the general fund, it frees up more funds from the automation fund to pay for digitizing documents. He noted that the paper documents will still be stored, but not at that location. He also reminded commissioners that the increased general fund revenue that’s generated by his office will more than cover the cost of the employee. Outcome: Commissioners unanimously gave initial approval to the requested changes for the clerk/register of deeds office. A final vote is expected at the board’s meeting in August. Appointments to five Washtenaw County boards and commissions were on the July 10 agenda. Police services steering committee: Scott Cooper, representing non-contract areas for a term ending Dec. 31, 2014. Washtenaw County/City of Ann Arbor community corrections advisory board: Tori Noe for a term ending Dec. 31, 2013. Food policy council: Seema Jolly, filling a slot representing a nutritionist, for a term ending Dec. 31, 2013. Workforce development board: Renee Adorjan for the community-based organization slot for a term ending Dec. 31, 2014; and Fred Pittman for the veterans slot for a term ending Dec. 31, 2015. River Raisin watershed council (alternate): Evan Pratt. Rabhi said he planned to hold off on making nominations to the county historic district commission. Outcome: All nominations were confirmed unanimously without discussion. During the evening there were multiple opportunities for communications from the administration and commissioners, as well as public commentary. In addition to issues reported earlier in this article, here are some other highlights. During public commentary, two people spoke about the importance of funding human services organizations. Margy Long, director of Washtenaw Success by 6 Great Start Collaborative, thanked commissioners for their support of human services in this community. She described the importance of investing in early childhood programs. Success by 6 has one goal, she said – to ensure that every child in Washtenaw County reaches kindergarten in good health and ready to succeed in school. Margy Long, director of the Washtenaw Success by 6 Great Start Collaborative, talks with county commissioner Andy LaBarre (D-District 7). As many as two out of four kids don’t meet that goal at this point, she said, and there are over 40 organizations collaborating to find ways to improve that number. Research has shown that the first five years of a child’s life are critical to their success in learning throughout their life, she said. Long pointed to the return on investment that comes from support during those early years of childhood, including an increased likelihood in graduating from high school and earning a higher income later in life, and less likelihood of criminal activity. Nicole Adelman, executive director of Interfaith Hospitality Network-Alpha House, described the nonprofit as an emergency shelter for children and families experiencing homelessness. Her organization works with families to find employment, increase income, and find affordable housing. She also serves on the board of the HIV-AIDS Resource Center (HARC) and the Washtenaw Housing Alliance. Adelman said she knew she was preaching to the choir for many commissioners, and she thanked them for their support. IHN-Alpha House receives about $90,000 each year from the county’s office of community & economic development through the coordinated funding approach. Losing that funding would devastate the agency, she said. It doesn’t get much worse than not having a place to live or knowing where your next meal is coming from, she said. The demand already exceeds the available resources, Adelman added. Budget cuts are incredibly hard, she said, but she’s asking the board to dig deeper and find somewhere else to cut. She noted that she’s a 30-year resident of Washtenaw County, and she votes. The county funds services for people who have nowhere else to go. She said she’d bet that the board’s constituents are willing to vote for those who support human services funding. “I know I will,” she concluded. But in late June – soon after a U.S. Supreme Court decision on the federal Defense of Marriage Act (DOMA) – a ruling came down from U.S. District Judge David Lawson in Michigan that blocked the state from enforcing its ban on domestic partner benefits. Emerick noted that board chair Yousef Rabhi and the county administration acted quickly, and in less than one business day, those nine county employees had their health care coverage reinstated. She thanked the county staff and commissioners for their action, saying it affected a lot of people. Deborah Dean-Ware, pastor of the Church of the Good Shepherd, also thanked the board. She said her church has a long history of supporting the gay/lesbian/bisexual/transgender community, and they are working hard to see marriage equality become reality in Michigan. The county’s work on the domestic partner benefits “is a very powerful statement for justice,” she said. Felicia Brabec reported that the Washtenaw Intermediate School District has received a notice of award from the federal government, designating the WISD as the organization that will take over management of the Washtenaw Head Start program. The county has been administering the program for more than four decades, but last year decided to relinquish that duty. Brabec said that plans are being made for handling the transition. Present: Felicia Brabec, Andy LaBarre, Kent Martinez-Kratz, Ronnie Peterson, Alicia Ping, Yousef Rabhi, Conan Smith, Dan Smith. Next regular board meeting: Wednesday, July 24, 2013 at 6:30 p.m. at the county administration building, 220 N. Main St. in Ann Arbor. The ways & means committee meets first, followed immediately by the regular board meeting. [Check Chronicle event listings to confirm date.] (Though the agenda states that the regular board meeting begins at 6:45 p.m., it usually starts much later – times vary depending on what’s on the agenda.) Public commentary is held at the beginning of each meeting, and no advance sign-up is required. The Chronicle could not survive without regular voluntary subscriptions to support our coverage of public bodies like the Washtenaw County board of commissioners. Click this link for details: Subscribe to The Chronicle. And if you’re already supporting us, please encourage your friends, neighbors and colleagues to help support The Chronicle, too! I prefer the alternative structure that Steve Ranzini has suggested to the proposal that the County itself invest the Bond proceeds because it more closely achieves the stated objective of eliminating future risk to the County of these unfunded liabilities. I am concerned that if the County undertakes to invest the proceeds of the Bonds, it remains very much at risk to the returns that will be achieved (this is not a reflection on anyone currently at the County, it’s just the facts of investing.) Unfortunately, while the pension and insurance companies may be “hungry” for these types of deals, they are also smart enough to know that future returns may not be as rosy as the projections used by the County in their effort to sell this deal to the public and thus the cost to the County of getting out of these obligations is likely to be much higher than the $295 to $345 million figure that has been bandied about. This is a mess not unlike the one facing the City of Detroit. All this creative accounting does is to punt the problem down the road. Hard choices will have to be made, better make them now because the longer you wait, the more it will cost to fix this. I do not like Mr. Ranzini’s proposal, which involves the county buying an annuity. (In case readers don’t know what we are talking about, see here: [link]) I assume that the county would still have to bond in order to come up with the purchase price. Thus, this is merely an alternative investment device. It still involves a long-term risk, merely shifting the risk to the pension fund via an insurance firm that would undertake to deliver payments. Insurance firms are not magic; they also have to invest in order to make payments. The long-term investment risk is still there. There is no free lunch. The error here is that the BOC should not be attempting to settle the long-term issue all at once. Conditions are likely to change in a number of directions over the next 25 years. Any solution assumes a certain investment return, which is fallacious. Actually, I don’t see how a single annuity would work in this case. There are employees still contributing to the plan for uncertain periods of time, and I don’t see how guaranteed annuities for individuals could be determined at this time. I would guess that it will be a while before the dust settles from the Detroit Chapter 9 filing and that for the duration it would not be a good time to float a major bond issue. 1. It is likely to have an effect on municipal bond sales. This is being said fairly universally. In other words, interest that the county would likely have to pay on the bond may go up. 2. As the NYT article comments, it also has bearing on public pension benefits and the special protection that they (appear to) be afforded by the Michigan constitution. The Michigan bond market as a whole is unaffected. Mutual bond funds typically hold municipal bonds that are insured in the event of default for interest as well as principle. The Franklin Michigan mutual bond fund has thus far not shown significant changes in its trading price since the Detroit bankruptcy. So why does Washtenaw County have a AA bond rating and Macomb and Oakland Counties have AAA ratings? Saginaw recently had to postpone a sale and Battle Creek went on hold with one. Thanks for the pointer to the Franklin fund. According to Bloomberg, the Franklin Michigan Tax-free Income Fund (FRMTX) has shown a rather precipitous drop since May and is down 5% for the year. @7: interest rates were already rising before Detroit’s bankruptcy was announced. How much of the FRMTX drop is due to each factor is probably impossible to tell. You might look at similar funds in other states for a rough idea. It’s a good thing for Saginaw County, in any case. They most likely would have put their bond proceeds in to some other fund(s) that would lose much of its value in coming years, putting them in line behind Detroit. Better that they have to watch the developing downward trend (deflation) and rethink their option – holding cash and paying off debts as costs drop being the best of their likely limited choices, much like Washtenaw.